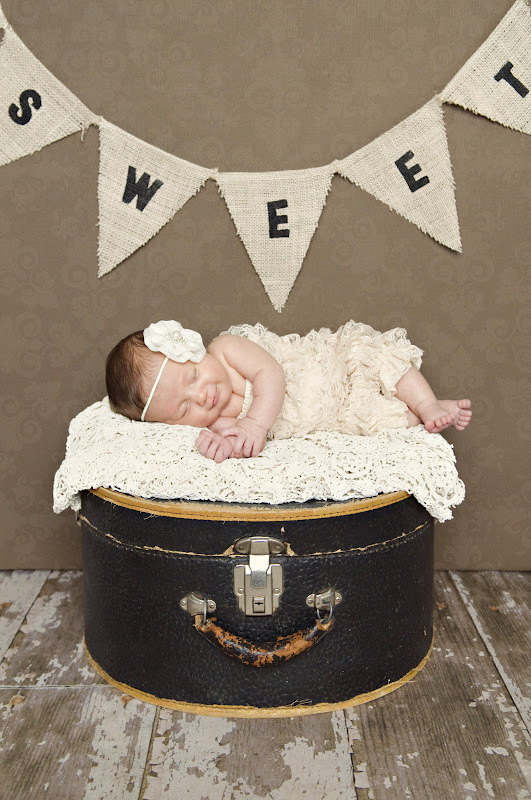 A few weeks ago, Ashlynn and I headed over to our photographer's studio to get A's newborn photos done. Since A was born early, we waited a few weeks for her to beef up a bit. In the meantime, we had some family photos taken at our house. 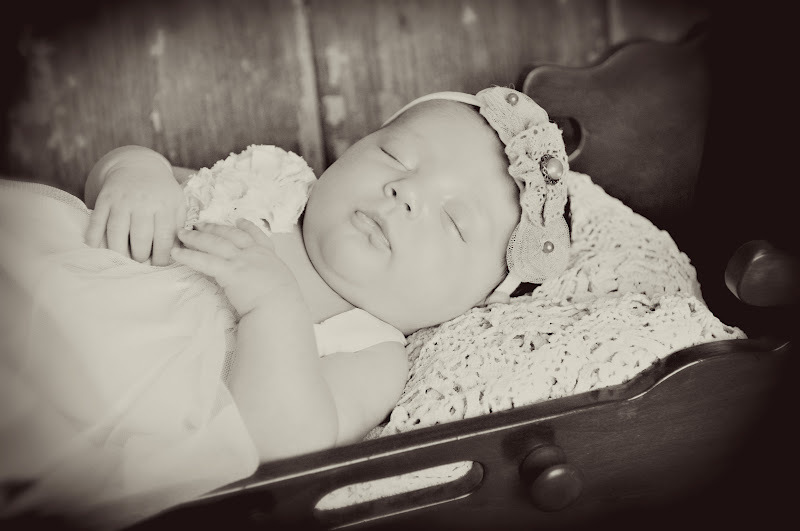 A was 6 weeks old when these pictures were taken, I'm just in love with her squishy arms and kissable cheeks. I hope you enjoy some of these pictures as much as we do! 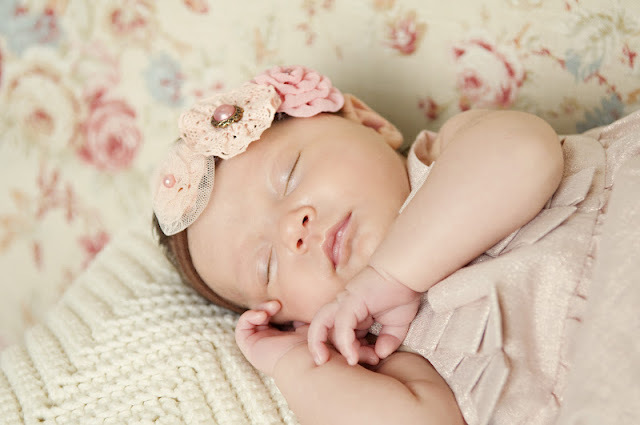 Medical Issues: The rash, cradle cap, is fading on her face. Leaving some dry skin behind, but at least the bumps are disappearing. Reflux seems to be diminishing too. 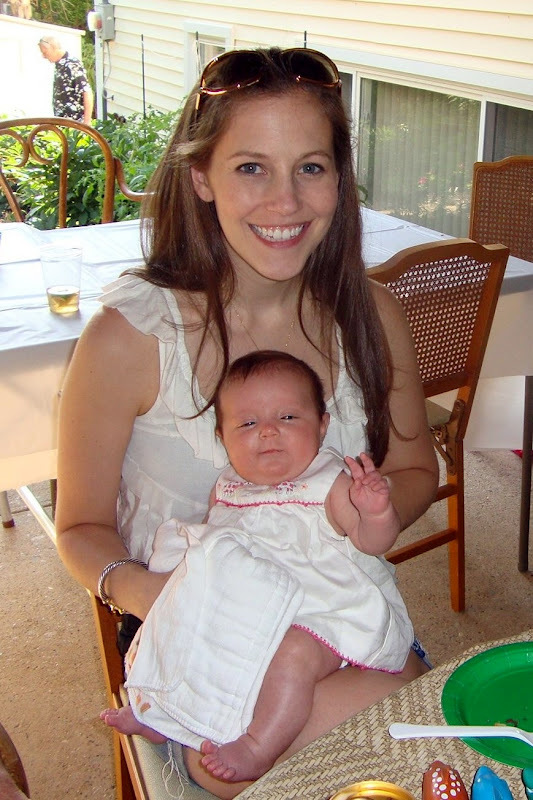 Sure, she spits up and sometimes full on vomits, but what baby doesn't? The signs of being in pain and discomfort have subsided. The arching, grunting, crying, Still gets the hiccups at least once daily and chokes every now and then while feeding, but I'm pretty sure that's a let-down issue, not a reflux one. Sleep: Definitely getting into a routine. It's not like clockwork, but for the most part she sleep from sometime between 8-10pm to 4-5am. Nurse. Back to sleep until 7ish. Nurse. Back to sleep until 9. Now, regarding nap time, that's even better! 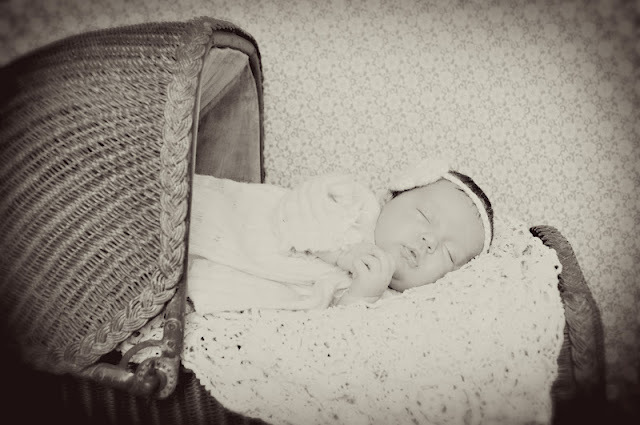 I finally hooked up her monitor and let her take her first nap in her crib last Thursday. She didn't really fall asleep, but stayed calm just kicking and looking about the darkened room. When I finally went up to get her, I got the biggest smile! Oh my god, my heart melted. And they didn't stop there, the reciprocating smiles are starting to kick in where her whole face will light up. She's smiled plenty before, but knowing she is smiling at me (or her daddy) on purpose. Ahhhh! Love it! Clothes: 0-3. Trying to get as many outfits in as possible because I have a feeling this size will be short lived. I'm hoping we can make it until the end of July. 1- because this size is the majority of her closet and 2- it's all adorable summer clothes! On Friday, we got a visit from Bopo (my dad). Although A slept almost the whole day, Bopo got some snuggles in and then we all went out to (belated Father's Day) dinner when the Husband got home from work. A slept through dinner, so we pushed it a bit further and stopped for milkshakes on the way home. Sweet girl. Saturday we left early in the morning to get on the road to Long Island. Usually this trip is met with horrendous traffic- every.single.time., but amazingly, we hit none! Ashlynn and I attended a friend's Baby Shower, while the boys/husbands (all college friends) all hung out in the sun all day. After the shower we headed over to the guest of honor's house and spent the night. A slept in the Rock N Play and did great the whole day, everyone just adored her (and how could you not?). No meltdowns and despite being a bit over stimulated by her new surroundings, didn't fuss. Skip Hop Activity Mat - I know this was my favorite item last week, but it's back again. 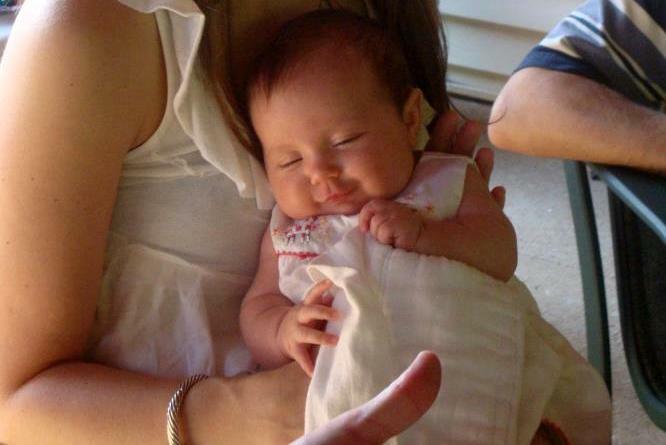 Ashlynn is really starting to become a smiley baby. She LOVES playing with the birdies and owls and will even hold on to the ring if I place it in her hand. 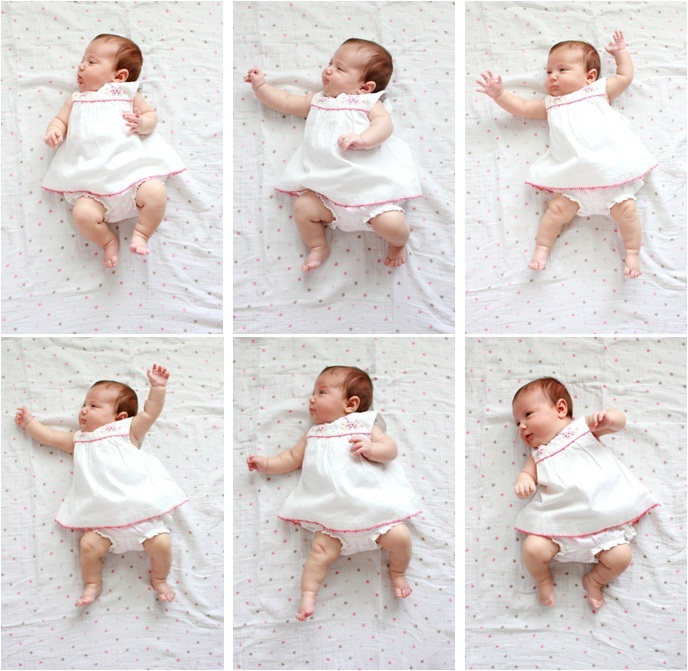 And for tummy time, she's able to hold herself up on propped elbows and look around. Same old. Mainly cries when hungry. I'm finally feeling confident enough to leave the house whenever necessary. I've been getting in a lot of errands - target, grocery store, doctor appts, etc all with A being behaved like a seasoned vet. Granted, she usually just sleeps the whole time, but that's all I can ask for! I've also started the process of donating my milk to the National Milk Bank. Since I had such an oversupply the first few weeks and A didn't need as much as I was producing being only 5 pounds or so, our freezer it literally full to the brim with bags of stored milk (save some space for ice cream and frozen fruit). Frozen milk stored in combination fridge/freezers should only be used up to 3 months (6 months for a deep freezer).since I'll be coming up on the expiration date towards the end of July and I dont foresee a reason to use some of it since she prefers to skip bottles, I thought I'd start breaking down my stash of 80+ bags of milk. I'm still in the midst of the application process, having passed the initial applications, I'm now waiting to have my blood drawn and sending it my DNA swab. I'll recap the whole process once I finally donate! On a lighter note, this past weekend at the baby shower I finally wore heels and a real bra for the first time postpartum. No joke. I've been soley living in my Rainbows/Toms and bra top tanks. It felt good to be "normal", well, until I had to nurse A and didn't have the quick access of just pulling down my tank in a moment's notice. I finally got around to posting Ashlynn's nursery to the Project Nursery gallery! If you can take a moment and head over and rate her room, hopefully we'll get picked for Project of the Week!! ... over at Spearmint Baby! ...and when I'm looking to get real fancy, I throw on a belt, some bracelets, and maybe even some make up so I don't look like a ghost. Thank you oh holy creator of bronzer! I wanted to invest in a cloth diaper stash built of one size fits all styles that will continue to grow with her, and maximize my savings. Unless she was going to be a 10 pounder, the styles I bought wouldn't fit right off the bat. I decided against investing in a newborn sized stash since I didn't know how long she'd be in them - 2 weeks or 2 months! Ha, looks like the latter is winning and I would have gotten my money's worth! I thought now that we will be converting to cloth soon, as A is beginning to pack on some pounds, I'd recap what we've been doing since we brought her home, how much we've spent to date (on both disposables and our cloth stash), and some of our opinions on products used so far. At the hospital A was using the provided Pamper's Preemies. 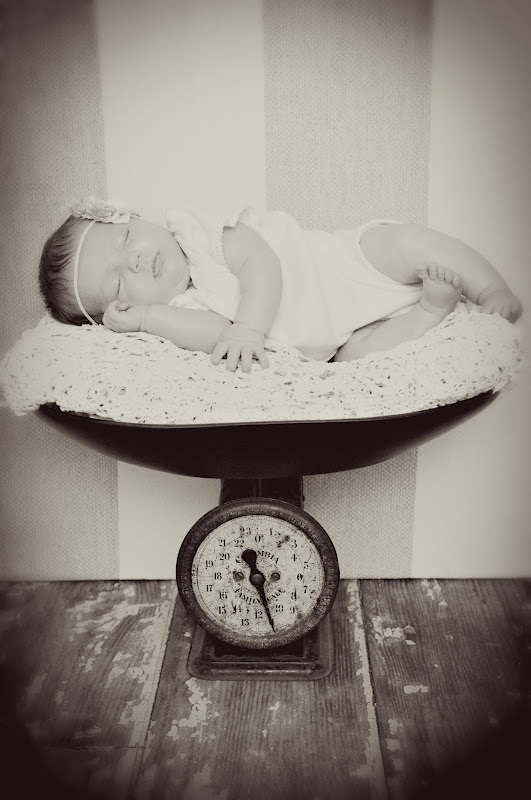 The hospital showed us that Preemie sized diapers really weren't any different than Newborn sized, and that she would grow so fast it wouldn't be worth our money to invest in box of preemies. They sent us home with a bag of 20 and after that ran out we started using the 7th Generation disposables I received at my shower. My friend, KK, had gifted me a whole case of newborn diapers (144 to be exact). One week after Ashlynn was born, I knew we were pretty far away from using the cloth diapers since she was only five pounds so I ordered more from diapers.com. I used the first time buyer coupon code and got a case for $31.99. I think we were going through a bag (36 count) every 4 days or so. We ran out end the end of the 5th week. I had already decided to order my next batch from Honest Company (the brain child of Jessica Alba), but I was still waiting on my delivery so I picked up one last bag at the store, this time in size 1 since 7th Generation NB weren't available. I actually preferred the larger size, so I called Honest Company to change my monthly supply to that size too. You can learn more about Honest Company here, but in short, it's a monthly subscription service for eco-friendly, sustainable, and affordable diapers, wipes, baby skincare and cleaning supplies. I ordered a Free Trial of 10 diapers (for the cost of shipping - $4.95) and decided the cute patterns, contoured leg flaps, and affordable price was worth the $84.90 price for the monthly supply. Honest will automatically send a month's supply or you can alter the settings to fit your baby's needs - more or less frequent if needed. Once we have A in cloth diapers regularly, I plan to order diapers from Honest on an as needed basis to have disposables on hand for emergency situations (stashing extras in the car and diaper bags), babysitters, travel, etc. They just opened The Honest Shop where you can order individual items, instead of a case, this past week. ...umm, have I ever mentioned I'm financial analyst by profession (and previously an accountant), no? Well, now it's glaringly obvious. I have 22 cloth diapers, which apparently is more than the magic number of 18-20 for every other or third day laundry. I know some people prefer to have all the same brand and I had to fight my OCD to branch out and try different ones. 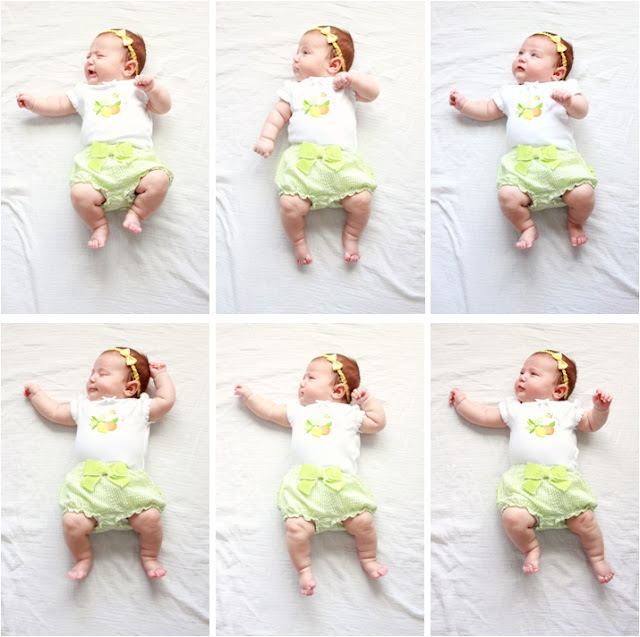 After all my research, I found a lot of cloth diapering mommas found certain brands to work better for their children over others including the more popular brands. I was afraid of stocking up on just one, only to realize it didn't work for us. After some experience with them, I'll report back with my ratings and reviews on each style. As you can see, my total initial investment was quite low, clocking in at just over $250. However, since I did receive some as gifts, I thought it would be a better reflection to include their value too. 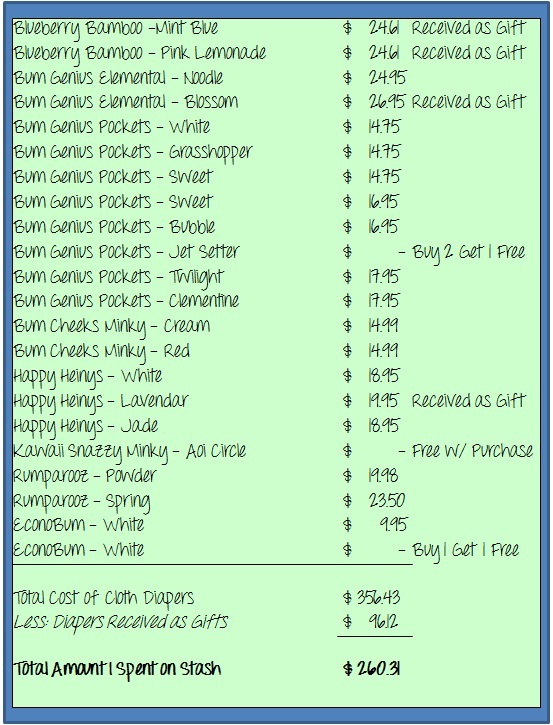 Based on the $356.43 value of the stash, each diaper averages $16.20, which if you've shopped around and have been turned off by the $20+ prices for similar styles this is proof that waiting for sales, promotions, and coupon codes can get you a full stash with some of the top rated brands for a relatively low price. All in all, we've already spent half of our cloth diaper investment on disposables in just 2 months! So far having only used disposables, there isn't too much to compare other than brands. I didn't mind the Seventh Generation diapers, though the "natural" color can look a bit weird. I don't have to have diapers with lolli-pops and ice cream cones on them (although Ashlynn is wearing one right now), but the natural coloring just looks dingy compared to clean and crisp white. However, it is nice that it doesn't show through clothing like a pink diaper with stars. The husband is a huge fan of the Honest diapers. He feels they are just constructed better. We did experience a touch of diaper rash right before we switched to Honest. I'm chalking it up to not frequent enough changes. 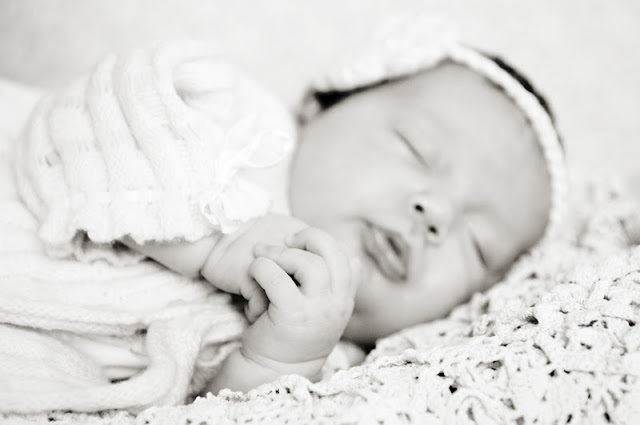 We change Ashlynn before feedings since it's easier on her reflux. If we lay her down after a feeding for a change, she's more likely to spit up. So a lot of times well do a diapee change (yes, that's what it's called in our house, not a typo), feed some milks (thanks to HR for that one), and then she'll pass out in her usual milk coma never alerting me to when she's wet until the next change. It wasn't until about a week of using Honest Diapers and their wipes did it vanish, so maybe they do wick away moisture better. Overall, we are now big fans of Jessica Alba - the husband always has been because she's hot, and I'm newly won over (never understood why she was treated as A-List when some of her main credits include Spy Kids and Honey) because of her efforts and initiative to start this company. 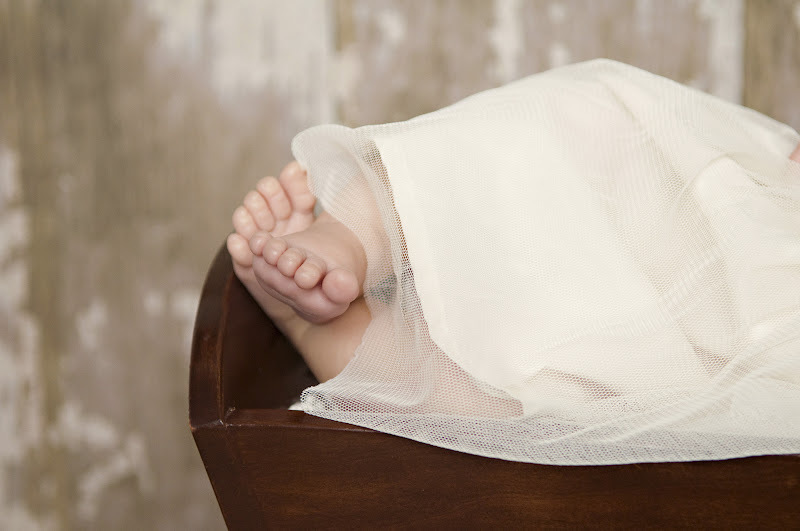 Disposable diapering is super easy and while it'd be really easy to continue with it and feel good that we are purchasing a diaper that isn't full of chemicals and has some biodegradable properties, the sheer amount we go through in terms of waste and cost, is still enough to make us glad to switch to cloth. I'll be attempting the change after A's 2 Month check up next Monday!